A lot of people seem worried about bank failures and the FDIC. There have been a few bank failures in the past year or two that have gotten a lot of press and raised concerns.. With the situation of the banking industry there are some grave predictions that many more banks will fail. I always like to look back at history so we can keep things in perspective. 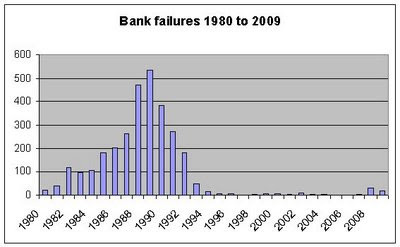 Today I'll look at the # of bank failures from 1980 to today. Of course 2009 only covers through today so its a partial year. As you can see the rate of bank failures in this decade is relatively small compared to the fallout from the S&L crisis in the 80's and 90's. In most cases the failed bank was taken over by another bank. Only rarely does the FDIC have to completely take over the bank and liquidate. I'm not sure exactly what the difference between a "failure" and an "assistance" are so some of these might not be outright failures.